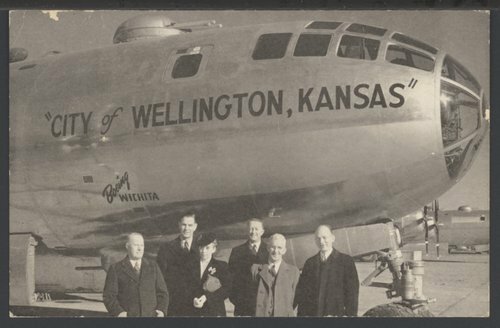 A postcard showing unidentified Wellington, Kansas citizens with a Boeing B-29 Superfortress. The residents of Wellington raised a total of $685,000 in their Sixth War Loan Campaign, and with that money they purchased and presented to the Army Air Forces this Boeing B-29 Superfortress. The photograph was probably taken in Wichita, Kansas where the airplane was built.